Japanese director Takashi Miike downplays his pride about having made his 100th film with “Blade of the Immortal”, and indeed, whether they are 100 or 50 or 20, what counts is the quality of the body of work one has made over the years. And while there may have been weaker entries, the overall impression Miike’s films leave behind is one of versatility, creativity and provocation, since, even with an average of six to seven films per year none of his works feel as if they have been churned out. Instead, we witness the film of a true auteur, one who works fast and is unafraid of the changing tones and genres he has worked with. During the 2017 Sitges Film Festival, Miike described how it does not matter to him which film he is working on since he approaches every one just like it is his first, a statement quite fitting considering the aforementioned shift in tone and genre in his films, sometimes from one project to another. What it boils down to is the threat of becoming stale, of standing still, something Miike seemingly is afraid of, and is the reason he keeps on working rather than going on extended holidays. In an interview included in the release of his film “The Happiness of the Katakuris, ” the director states how he will likely continue making films for as long as he is able to, as long as he has the strength to do so, and people to help him. With this kind of attitude and at this rate, who would be surprised if Miike actually reached 200 films in his career, a goal he might be closer to than some think, since the current number does not include some of the early V-cinema entries in Miike’s career. Despite “Blade of the Immortal” being an adaptation from a popular manga, the project came as something of a breath of fresh air to Miike and many members of the cast and crew. Given the recent popularity of polished-looking teenage movies, the source material and the director’s approach to it make for a refreshing “rawness” in the midst of those movies, according to Miike himself, as he describes his crew’s and cast’s reaction to the project. This was, reportedly, especially true for the many action scenes and the sword choreography to which Miike applied his approach of making them work rather than look “cool” as so many movies would try to do. Just like when he had worked with source material before, for example with “Ichi The Killer” or “The Happiness of the Katakuris”, freedom and taking the opportunity to try for something new is what Miike, according to an interview with Slant Magazine, was trying to do. “Blade of the Immortal” is a samurai film, one which blends realism and the supernatural to achieve an interesting view on the timeless theme of many of these movies, ranging from the works of Akira Kurosawa to the Zatoichi- or Lone Wolf and Cub-series: the dichotomy of life and death within the samurai code of honor and loyalty as well as the paradox that lies within. 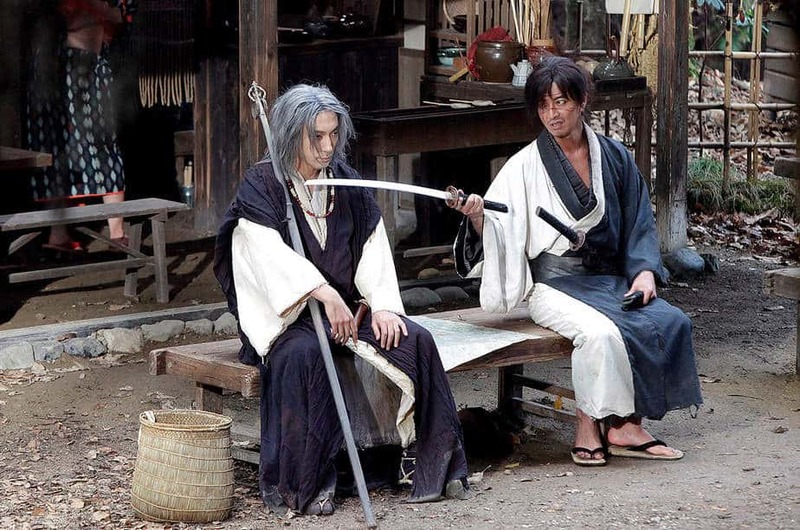 Manji (Takuya Kimura) is a samurai unable to die. Since his lord has deceived him, leading to the murder of a high official and his servants, he and his sister Machi (Hana Sugisaki) are fugitives on the run. Traumatized by the bloodshed, her brother has caused Machi to fall into the hands of bounty hunters who kill her, even though Manji has given up his weapons. After the following fight, that left the men dead and Manji severely wounded, an 800-year-old nun gives him the gift of eternal life, making his wounds heal rapidly and him wandering the earth desperately, wishing he might join his sister in death. Many years later, he is approached by a young girl named Rin (Hana Sugisaki) whose father had been killed and mother kidnapped by Kagehisa Anotsu (Sōta Fukushi) and his Itto-ryu clan, in an attempt to forcibly unite all sword-fighting-schools, securing a safe source of income during peace time for them. Rin wants revenge for her family as she hires the reluctant samurai who is more than skeptical about her lust for blood. However, as she is attacked by the clan, he decides to step in and help her, accepting her offer as well as agreeing on training her in assassination techniques. But Rin is not the only one holding a grudge against the Itto-ryu and their leader, and while Manji starts dueling with Anotsu’s subordinates, the clan’s deeds have not gone unnoticed from the eyes of the shogun, whose administration offers their leader a lucrative offer which might result in more power and influence for him and his clan. Even though “Blade of the Immortal” differs in many ways, the essential premise of the story should feel familiar to loyal followers of the director’s work, as it leads back to his 2004 film “Izo”, whose samurai protagonist was equally immortal, killing each and every one on his way towards taking revenge, and thereby completing the monster he slowly turns into. However, during their first encounter, Manji seems disinterested in anything having to do with his past, denying Rin’s quest and even making fun of her naive quest for revenge, a plan she has not thought through in her young mind, as he stresses in front of her, hence the repeated calling of “stupid girl” in front of her. Indeed, it is the memory of his past mistakes, his failure in showing loyalty and the same thoughtfulness he accuses Rin of as well as her resemblance with his sister, which sway him to support her on her quest, or at least give her the right tools and techniques in order to train her properly for the task ahead of her. The student/teacher-plotline of the film follows different purposes besides the obvious of serving as a link between the two characters. Within the hero’s quest going through the experience of taking responsibility for life, in this case of Rin’s as well as of his own, and re-discovering truths, such as loyalty, are necessary ingredients in re-establishing a link with the sphere of the living, one which Manji has abandoned long ago after his sister’s death. Indeed, the years have marked him with his body showing several battle scars, his right eye shut from the fight with the bounty hunters and a severe scar on his face, visible sign for his status as the outcast within the world of the living he so desperately wants to leave behind for good. At the same time, the choice of costume – a black and white kimono reminiscent of the yin and yang-symbol – additionally signifies his status as being in between both worlds, one on the verge of death and life, and our world, one who has yet to make the choice between the two. Given the significance of politics and economics with the introduction of the Itto-ryu’s quest to improve their status within the rigid social hierarchy of Japanese society, Miike has perhaps added another familiar theme known from films like 13 Assassins, Harakiri and again Izo. Loyalty and brotherhood, as two defining factors of the samurai code, have added to the misery of the characters, even though the two can be distinctly different entities altogether. Even Anotsu, as the film’s villain, is shown as a mere pawn for those in power who are all but determined to reset the order back to normal if given the chance; even supernatural forces have proven to be powerless against the iron chains of class and materialism which are presented as stronger than any human bonds. In the end, it has rather opened the doors for exploitation, further violence and bloodshed, with Miike’s direction and Tetsuya Oishi’s script showing the quarrel of two opponents as a mere sideshow in the grander scheme of things. Perhaps this is the right world for the approach Miike has chosen once again, just like in his interesting re-imaginations of Harakiri and 13 Assassins. With no clear distinctions between the right and the wrong, the good and the bad or the real and the supernatural, the film is a blend of all of these factors rather than an effort to keep them apart. The battle scenes, especially the incredible showdown, have a distinct, almost improvised look, adding to the realism of the film in these scenes with the impact of every sword thrust feeling authentic while still maintaining the roots of the source material. “Blade of the Immortal” is an entertaining film showing the qualities Miike has learned over the years, the fast pace, the thematic roots of loyalty, brotherhood and the outsider as well as the embrace of a character’s contradictions or ambiguities. Far from being something like a mere “best of,” “Blade of the Immortal” delivers fantastic action sequences and great performances and a director who is still hungry for more since 100 is still not enough. Not for someone like Takashi Miike.